The real reason Guantanamo detainees have returned to the battlefield. New battlefield reports indicate that at least eight and as many as 25 of the 202 prisoners paroled by the Pentagon from Guantanamo Bay, Cuba, have rejoined the fight as members of the pro-Taliban resistance in Afghanistan, or as part of al-Qaida. One of the now-free prisoners fighting in Afghanistan proudly proclaimed that he won his parole simply by lying through his teeth throughout the time he was at Gitmo. And the Pentagon blames fibbing prisoners and inadequate screening systems—driven by this summer’s Supreme Court terrorism decisions—for allowing these men to escape from captivity. It’s more than a little disingenuous to blame the Supreme Court for these problems, though, especially since most of these detainees were released before the June decisions were handed down. The real problem is that the Defense Department and U.S. intelligence community developed inadequate and unreliable systems for screening detainees at Guantanamo Bay. Just as one might expect, detainees exploited the flaws in this system to secure their freedom by any means available—including telling a few lies to deceive their captors into believing that they were innocent. Ironically, it didn’t have to be this way—international law would have allowed the United States to warehouse the Gitmo detainees until “the cessation of active hostilities” and to interrogate them, too. But by rejecting the Geneva Conventions’ restrictions on Gitmo detainee operations, the United States also rejected its benefits—creating the situation we have today in which paroled detainees have returned to fight against us. The paroled-detainee problem traces its roots back to the fateful Bush administration decision in January 2002 to exempt Guantanamo detainees from the Geneva Conventions. A classified memo written by White House Counsel Alberto Gonzales declared Geneva anachronistic in the “new kind of war” faced by the United States—especially to the extent it limited the ways U.S. intelligence officials could squeeze detainees for information about terrorist operations. As a matter of policy, the White House declared that Gitmo detainees would be treated humanely in accordance with the Geneva Conventions—but not actually granted that treaty’s legal protections. In every facet of detainee operations—from capture to transportation to interrogation to release—the third Geneva Convention and the Army’s own regulations for its implementation were declared inapplicable. It would be a gross understatement to say there was “blowback” from this decision. The administration’s decision to scrap Geneva came at roughly the same time as its moves to abandon the Rome Treaty (establishing the International Criminal Court), the Kyoto Protocol (setting goals for the reduction of global warming), and the Anti-Ballistic Missile treaty (which would have precluded the United States from pursuing its current missile defense effort). After a half-century as the world’s leader on international law, the U.S. was quickly earning the status of the world’s brigand. Politicians, lawyers, activists, and even editorial cartoonists lambasted the Bush administration for its Guantanamo policy, calling the camp a “black hole” for the law. The pictures of hooded and shackled detainees wearing orange jumpsuits at Gitmo came to symbolize American policies toward terrorism and the Middle East more generally. 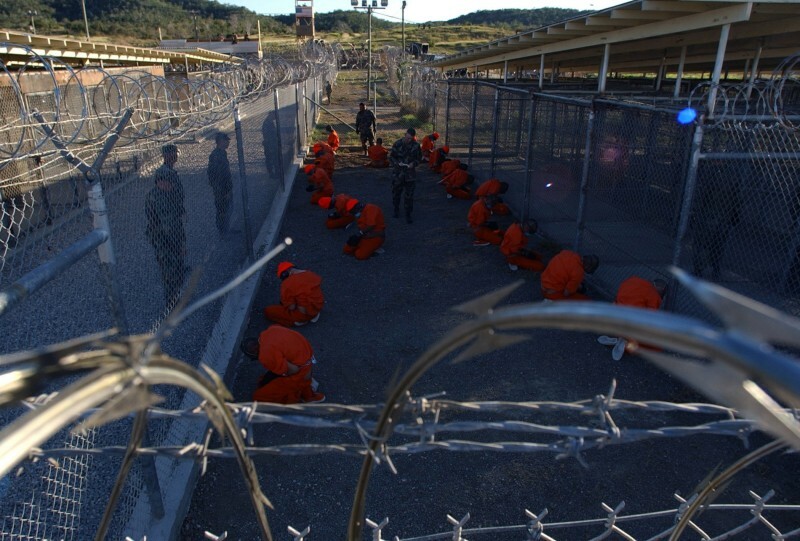 During the run-up to the Iraq war, the Guantanamo issue surfaced repeatedly as a bone of contention for nations opposed to the U.S. war in Iraq and its larger war against terrorism. The issue continues even today to hobble U.S. efforts to win support abroad for its actions against terrorism. In response to this blowback, the Bush administration slowly back-pedaled from its initial policies with respect to the detainees. In October 2002, the Pentagon began to repatriate Guantanamo detainees—usually with assurances that they would be tried and detained at home. These moves were designed to restore a veneer of humanity and respectability to the Gitmo operation, by releasing the very young and the very old, as well as those who appeared to be innocent of any connection to al-Qaida or the Taliban. These policy changes were also aimed at showing the Supreme Court that the administration could change its stripes on this issue and that judicial intervention was not required. (The Supreme Court didn’t fall for that, holding last summer that the remainder of the Guantanamo detainees had the right to petition in federal court for their release.) Yet, the core of the administration’s policy remained the same: Geneva doesn’t apply to Gitmo; the detainees there are the “worst of the worst,” to use Defense Secretary Donald Rumsfeld’s expression; and the only justice they would ever get would come from a military tribunal. And since the court handed down its rulings, the Pentagon has invented a new system of “Combatant Status Review Tribunals” to decide which detainees should get sprung. To date, those panels have reviewed more than 200 cases and recommended one detainee for release out of the 95 they have formally decided thus far. It’s hardly surprising that the men imprisoned at Guantanamo would lie or cheat to earn their release. Any soldier would do the same thing under similar circumstances, including U.S. military personnel—who are honor bound by the U.S. military’s Code of Conduct to “resist by all means available” and “make every effort to escape and to aid others to escape.” However, it is surprising that sophisticated U.S. intelligence officials would fall for these deception efforts. One detainee who has rejoined the jihad in Afghanistan, Taliban field commander Abdullah Mehsud, bragged that he had concealed his identity as a Pakistani from U.S. interrogators by using a fake Afghan ID and lying to them. A Pentagon spokesman told the Los Angeles Times, “If he fibbed, we’ve said from the beginning that these guys are masters of deception,” and a former Pentagon official involved with detainee issues said that “you can’t trust them when they say they’re not terrorists.” But how daft were our interrogators at Gitmo if they fell for a fake ID? And how much trust can we put in the intelligence gleaned from Gitmo, if the interrogators there fell for whoppers like Mehsud’s? The administration chose in January 2002 to shred the Geneva Conventions because it thought those old rules would constrain it in this new kind of war. But as Marine Lt. Col. William Lietzau, who worked on detainee issues in the Defense Department’s office of general counsel, told the New York Times: “There were very good reasons not to designate the detainees as prisoners of war, but the claim that they couldn’t be interrogated was not one of them.” Geneva does put some constraints on the handling and adjudication of detainees, but they were meaningless restraints. The most important task—interrogation—could be accomplished equally well with Geneva in place as without it. More important, the Geneva Conventions already contained the solution to the paroled detainee problem: Part IV of the convention spells out the exact rules for repatriating sick and infirm prisoners; Art. 118 of the treaty establishes the rule for repatriation at the end of hostilities. Had the administration followed Geneva all along, it could have simply invoked the provisions of this time-honored treaty to support its policy of holding the Gitmo detainees indefinitely, or at least until the insurgency abated in Afghanistan, from where the majority of the Gitmo detainees came. Had the administration done that, it would now be on solid legal and political ground, and U.S. soldiers would likely not be facing Mehsud on the Afghan battlefield. Mehsud says he was a combatant long before he ever made it to Guantanamo, and that he simply lied to his captors about it. But others, like an Afghan teenager released in January 2004 only to be recaptured recently as part of a Taliban unit, appear to have been turned into terrorists by their experiences in captivity. This trend is not universal—Yaser Esam Hamdi, the enemy combatant whose case made it all the way to the Supreme Court, appears not to have been radicalized by his experience. Nonetheless, the fact that our incarceration system may be creating and then releasing terrorists to fight against us should concern us. In his infamous October 2003 memo, Rumsfeld asked if “we [were] capturing, killing or deterring and dissuading more terrorists every day than the madrassas and the radical clerics are recruiting, training and deploying against us?” The answer to that question remains uncertain. But what we do know now is that our own policy—and our flawed execution of that policy—is helping create terrorists at Guantanamo and then release them into the world. It hardly takes an expert to say that the way to win the war on terrorism is not to create more of it. But the haphazard, extralegal, credulous policies at Guantanamo have done just that.